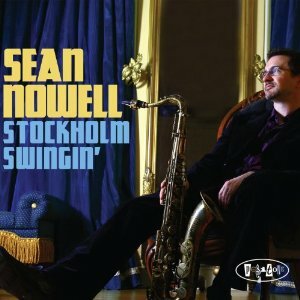 Well, swingin' is definitely the best way to describe Sean Nowell's third album on Posi-Tone, Stockholm Swingin'. It's a well balanced and straight-ahead killer set from the Alabama native now New Yorker. Stretching and flexing notes like Dexter Gordon or Sonny Rollins, Nowell sets a fire in a live session. More scintillating than his previous two releases only in the sense that in the live setting you really get a better feel for the band, the arrangements and Nowell as a performer. "Ack Varmeland, Du Skona" (more known loosely as "Dear Old Stockholm" for the rest of us) is smokin'. With the usual infectious top-tapping notes delivered beautifully from Lindberg and Nowell, this classic number takes on rich lively tone. Juxtaposed with the great performance from Fredrik Olsson it feels like a Kenny Burrell/John Coltrane session or a flavourful early George Benson album. Nowell's own "NY Vibe" is cool and bluesy at times. It really does spell out New York for those of us who have experienced the scene for years. A great little number that even my kid was flipping out over. Nowell pulls a lot of punches with these original compositions. His playing is bold and has a lot of strength. "NY Vibe" has a lot more in common with his previous record The Seeker. It's a burst out of speakers and spell a presence of an real entertainer. The entire quintet set a real pace and impact on "Sweet Night", written by Lingberg and Olsson. Nowell allows the guitarist to take to the fore but the rest of the group are in unison adding stylistic touches that standout in their own way along the path. Nowell rejoins the group just in time to tear into the mid section; adding a buoyancy and vitality that blisters with life.